Frederick DouglassA crowd of about three hundred people, including forty men, came from five miles round. No woman felt capable of presiding; the task was undertaken by Lucretia's husband, James Mott. All of the resolutions were passed unanimously except for woman suffrage, a strange idea and scarcely a concept designed to appeal to the predominantly Quaker audience, whose male contingent commonly declined to vote. 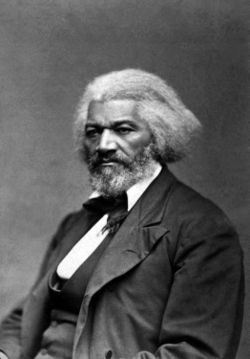 The eloquent Frederick Douglass, a former slave and now editor of the Rochester North Star, however, swayed the gathering into agreeing to the resolution. At the closing session, Lucretia Mott won approval of a final resolve "for the overthrowing of the monopoly of the pulpit, and for the securing to woman equal participation with men in the various trades, professions and commerce." One hundred women and men signed the Seneca Falls Declaration-although subsequent criticism caused some of them to remove their names.